Thanks again to mreheater72 for taking the time to send in all the pics and for letting me use them! Great set of pages and great pictures. the review is great, thanks a lot for the efforts you have done, it definitely took a great part of your time. I think the way you structured it is very good. I am a little bit proud that you use my photos for your mreinfo.com site! Also thanks for the additional pics from the B-Units, mine are still closed . The presentation of the opening method of cans with abrasive paper and their refilling is still missing! But I have not forgotten it! Please be a little bit patient for some more time! I remember on one fire, I had the spagetti and I got very sick on it and couldn't eat much after that. For that fire, I really only ate the fruit - peaches, etc., "John Wayne bars", pound and fruit cakes. That was about it. Still the spagetti was my favorites. Anyways, the peanut butter and cheese would come in the little cans and we would throw them in the fire and they would explode, lol. I was an FNG and when a slurry bomber would come in, there would be a smaller plane, guiding it in. I went to one side of this ridge, to take a "rat dump" and just was squatting down, when I saw the lead-plane coming straight at me, with the slurry bomber right behind it! Next thing I could see, was the orange-red slurry coming or spewing out, so I thought I was going to get the brunt of it and dived to the ground, with my pants still down! As the FNG, I didn't know that they were dropping over us, into this canyon behind us. What a dummy. Oh man, I had the same experience back in 1998....though not quite like yours mind you... Also we didn't have C-rats then but MRE's...was just wondering which 'Shot Crew were you on back then? 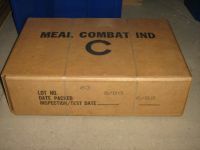 I love pics of those old MCI rations...they are akin to looking at pictures of the family. I was with the Flagstaff Hotshots, we mostly fought fires in the AZ desert, Utah, California and Nevada. It was fun also to work with those prison crews! 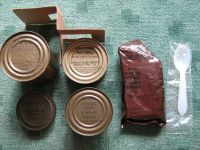 I remember on one ridge, some CA crew was passing by and one guy gave me a LRRP ration - it was the spagetti and meatballs ration. 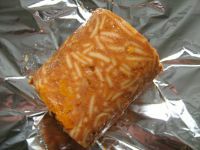 I added water to the spagetti and then ate the disk bars, that were pretty good. They also had a rice ration and can't remember which one had the orange or lemon flavored cornflake bars, but they were pretty good. Bypah wrote: Are they edible??? Crackers, Cocoa Beverage Powder, Candy, Peanut Butter, perhaps the Cakes, Coffee, Creamer, Sugar, Salt and the Chewing gum. 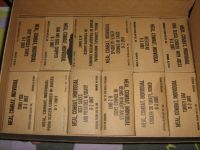 Curious if this box had any P-38 or similar can openers somewhere inside the box?